Both observations and simulations of galaxies show that the details of galaxy evolution are intimately affected by how stars form, evolve, and die within the galaxy. The deaths of stars is likely the most important in this cycle, as exploding supernova can have a significant influence on how and where further star formation occurs in a galaxy, influencing the global properties of the galaxy itself. The effect of supernova (and other processes like AGN) on the galaxy they sit in is called feedback. Star forming galaxies like the Milky Way are generally discy, meaning most of the stars and the gas in the galaxy lie in a disc. For the Milky Way, this disc is about 0.6 kiloparsecs (kpc) thick, and 30 kpc in diamater (1 kpc ~ 3261 light years). Stellar feedback may play an important role in determining what this disc looks like. Simulations also predict that massive galaxies like the Milky Way should contain very diffuse halos of hot gas, usually referred to as the circum-galactic medium (CGM). There has been work recently to observe these hot halos directly, but since this roughly million degree gas is so diffuse (about 10-100 particles per cubic meter), it is challenging to do. Better predictions for the properties of this halo would greatly improve our understanding of how it forms, and help lead to better observations. The authors of today’s astrobite study how supernova feedback can affect the evolution of the disk of a Milky Way like galaxy, including the rate of star formation within the disk, and also how the feedback can affect the hot halo. The authors setup a series of simulations of the formation of a Milky Way like galaxy, varying the amount of energy released by supernova explosions within the simulation. Historically, methods for including supernova feedback in galaxy formation simulations do so by assuming each supernova releases 1051 ergs of energy. Using this value makes some assumptions about how much energy is released in a supernova, and how effectively that energy gets distributed in the gas surrounding the now-dead star. The authors test how changing this value affects galaxy evolution, using 80%,, 40%, 10%, and 2.5% of this value in simulations labelled F80, F40, F10, and F2.5 respectively. This is equivalent to exploring how changing our assumptions on the effectiveness of feedback affects galaxy evolution. The simulations use the smooth particle hydrodynamics (SPH) code GASOLINE. Initially, each simulation looks the same, with 1011 solar masses of a hot, spherically distributed coronal gas, embedded in a spherical distribution of 1012 solar masses of dark matter. Each simulation is evolved for 10 billion years. In general, the gas eventually cools and collapses to form a disk, where star formation and supernova feedback occur. However, the details depend on the underlying supernova feedback. Surprisingly, the authors find that varying the feedback does not dramatically affect the star formation rate within the galaxies. Historically, simulations without supernova feedback allowed gas to cool too quickly, causing too much star formation. Energy injection from supernova moderated and reduced the star formation rate reaching better agreement with observations. 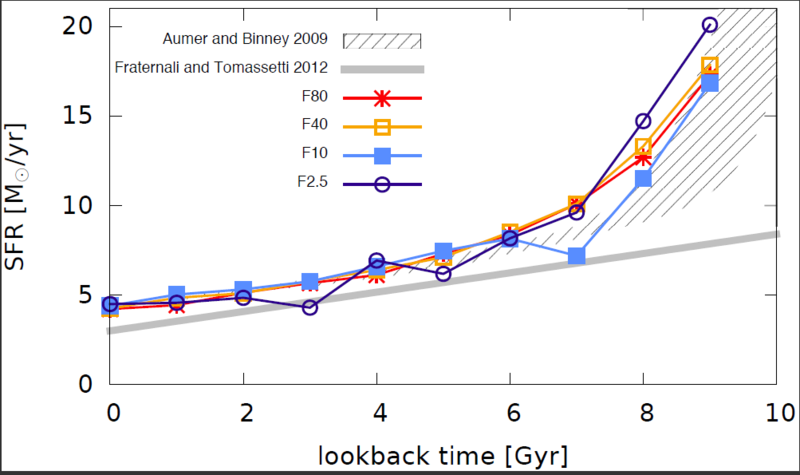 The authors compare the star formation rate for their simulations in Figure 1 (colored lines) against two different estimates for the star formation rate of the Milky Way galaxy (gray lines). Lookback time refers to the time from “now”, so 0 Gyr represents the end of the simulations, and 10 Gyr the beginning. In general, there are significant differences in the early universe (large look back times), but the feedback seems to not have a significant effect for most of the galaxy’s evolution. Each simulation shows roughly the same star formation rate, and each are in fair agreement with observations of the Milky Way. The morphology of the disks change dramatically with the feedback, however. Figure 2 shows column density (number density integrated along the line of sight) contours of cold, neutral Hydrogen (top row) and stellar surface density (bottom row) for the F80 (left) through F2.5 (right) simulations. When feedback is higher, the disk is substantially puffier, as the energy injection by more energetic supernova is able to drive out more gas from the disk. In the F2.5 case, the disk remains thin, with nearly all of the HI gas contained within the disk. The stars show the opposite trend, however. This is because the lower supernova energy simulations tend to form more stars at early times. These stars then have more time to move redistribute themselves within the galaxy, leading to a thicker stellar disk. 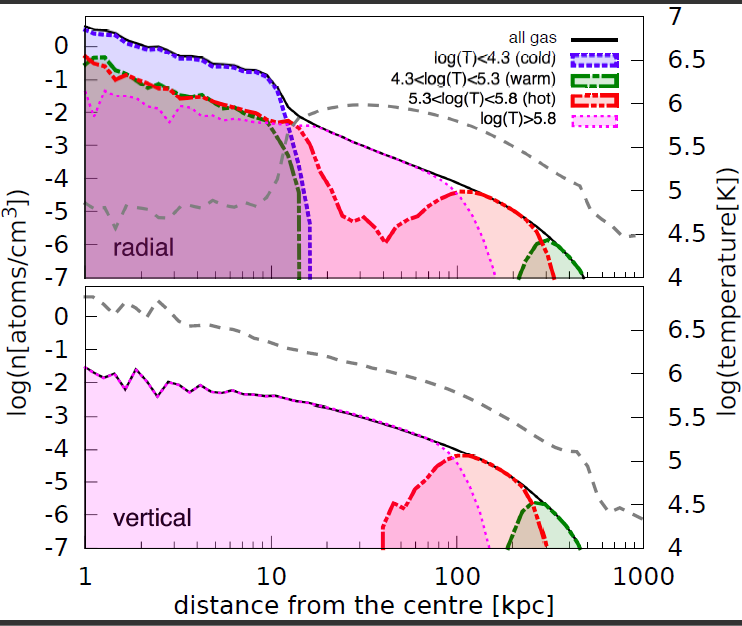 Figure 3 shows the density distribution of gas in the F80 galaxy split up into different temperature bins. The top shows gas within the disc as a function of distance from the center, and the top shows the vertical distribution of gas above/below the disc. The temperature regimes are chosen to correspond to different temperature regimes probed by studies that use absorption lines to study the diffuse halo gas. For example, the hot regime (red) is probed by a certain ionization state of Oxygen. The warm/hot gas that comprises the CGM of this galaxy seems to lie about 150-500 kpc from the center of the galaxy (the red and green humps seen in both plots). However, observations show that there should be some of this warm gas (green) within 150 kpc (and even down to a few kpc) of the galaxy. The distribution of the hot gas (red), however, does agree with observations. Feedback is responsible for generating a host of detailed properties of galaxy formation and evolution. The authors here have studied how feedback energy affects the gas and stars in the discs of galaxies, and the gaseous CGM surrounding the galaxy. These feedback models generally reproduce the star formation rates of the Milky Way galaxies, and some of the disk and gas halo characteristics match observations well. Yet some details on how that gas is distributed within the disk and halo, such as the distribution of warm gas, require more work to match observations. However, feedback energy is just one of many variables that affect galaxy evolution. There is still much to be learned until we can have a complete picture of how galaxies form. After braving the harsh long winters of the great white north as an undergraduate at the University of Minnesota, I am working through my first year as a graduate student at Columbia University, in the balmy NYC. My research as an undergraduate and now has been mainly focused on galaxy clusters. I am currently working with Dr. Greg Bryan and Dr. Mary Putman using simulation and observation to map and better understand warm gas in galaxy clusters, as a possible probe of cluster formation and evolution. Whenever I'm not in the midst of solving the world's problems, you can find me rock climbing... which is a surprisingly easy hobby to maintain despite being right in Manhattan.